Here is how to save the drawing you have done and how to open another one. With new versions of AutoCAD have plenty of choice, we can open the menu by clicking on the red symbol of AutoCAD upper left and then select “Save As” and choose the first option “Drawing”. We can click on the classic “File” menu and select "Save As", or we can simply use the appropriate key on the small Quick Access Toolbar at the top. In the image below, I show the three solutions in sequence. This will open a window like the one in the picture, where you can choose the location where to save your file and give it a name; you can also create new folders or delete, through the controls at the top. It works like the regular Windows file manager. As you can see at the bottom of this window is the area that says next to “file name” where you have to write the name for the file, replacing the voice (drawing1.dwg) that AutoCAD automatically assigns. You can avoid to write the name with its extension (.dwg), AutoCAD will place it too and save the file according to the type shown in the window below. On the entry below “Files of type”, you can choose the type of file to be saved by choosing one of several versions available. As a basic approach will find the version you put in the preliminary settings, at the beginning of the course (where we talked about various types of AutoCAD files), but if necessary you can choose a temporary one, regardless of the base settings. Then clicking on the “Save”, the file is just stored in the chosen path, but beware, it is not closed but remains active and you can continue to work on it. To save the changes you have made more simply click on “Save”, always in the menu “File”, in this way the file which you already nominated at the time of the first saving, will be updated by overwriting on himself without creating a new one. Well, keep in mind that this does not directly update the design you’re working, but makes a copy in another specific folder and can be resumed in case of emergency. Therefore, you must often save the drawing you are working on, by the menu "File > save...", because if the program crashes (I assure you it happens) you lose your job done. You can also save the file by clicking on the “standard toolbar” button on the third button representing a floppy disk . To close the file on which you are working, click on the cross “X” in the upper right (not the first higher on a red background, that closes AutoCAD, but the second below). At the time of closing, if the design has not been saved after the latest changes, a window appears where we are prompted to save the file or not. As you may have noticed on the menu that we have just seen can give you many other commands, the main ones are used to save, create a new drawing, open an existing one and print. Will appear a window similar to the one for saving, where you can scroll through the folders on your hard drive, to the location where is the file to open, then double-click it or select it and press “Open”. In the window next to “Files of type” you can choose between certain types of files that AutoCAD can open and whose “dwg”, as mentioned above, is the standard. 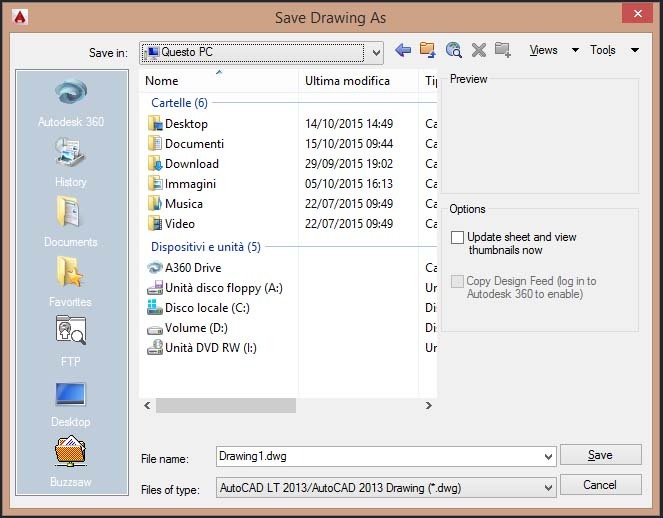 The other type of files that AutoCAD can open and save is the “dxf”, which is similar to “dwg” and can be used to exchange drawings from AutoCAD with other programs. Then there is the format “dwt” drawing template, that refers to a selected folder into AutoCAD where there are files that already contain squaring and masks in various sizes A4, A3, according to specifications “ansi”, “iso” etc.. known as the “template”. For the moment being occupied by only normal “dwg”. Please note that you can open multiple files at once, which similarly to the windows of “operating system”, can be reduced, enlarged or sent to an icon, can be viewed one at a time or simultaneously. I will not elaborate on what should be intuitive if you have a minimum of familiarity with Windows. Create a new design from scratch. 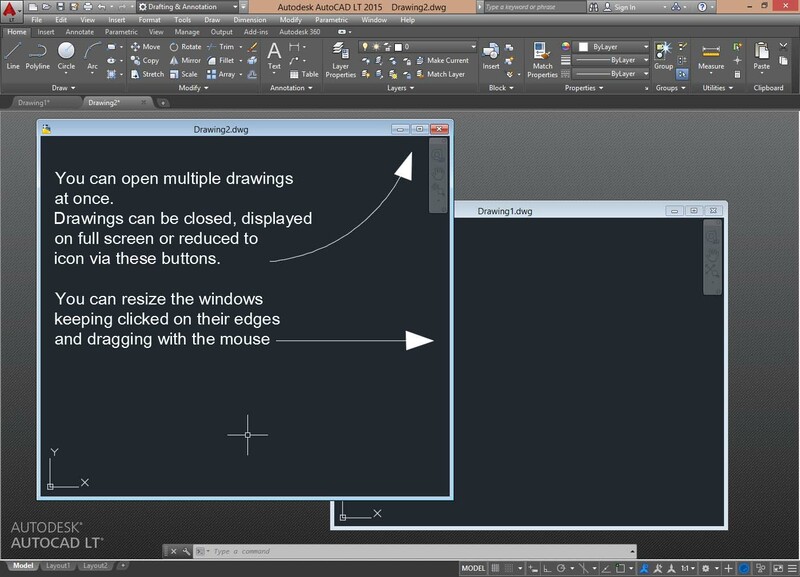 To create a new design from scratch you click the menu "File> New .."
In the window that appears ( may be different from what appears to open and save if you have an old version of Autocad ), click on the arrow beside the button "Open". On the menu that appears select " Open with no template - Metric . " This will open a new drawing window.